Drawing from legend, literature, film, and perhaps even real life, individual songs of “Horror Show” tell the stories of nightmarish creatures like Dracula, Frankenstein, and the Mummy, all seen through the darkened vision of Iced Earth. Also featured are the Wolfman, the Phantom of the Opera, Jekyll and Hyde, Jack the Ripper, Damien (The Omen) and the Creature from the Black Lagoon. 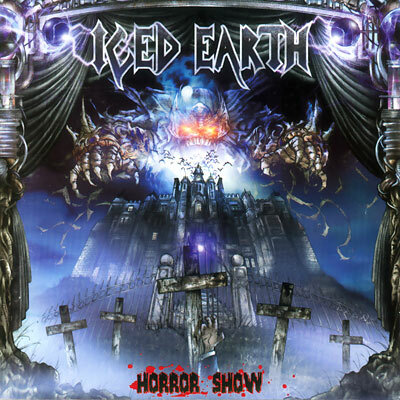 Die-hard fans of Iced Earth may be aware of the band’s longtime fascination with the subject of horror; in the early days of the band, such themes were tightly tied in with both the music and the presentation. Thus, “Horror Show” stands as both a return to the roots as well as a great step forward. Mixed and Mastered at Morrisound Studios, Tampa Florida. Illustrations by Danny Miki and Travis Smith. Art direction by Travis Smith. Iced Earth logo designed by Jon Schaffer.